1974 Weber Surfboards (USA) Bonzer 6 ft 8"
Moulded wide base, thick profile, rear fin tab. Not toed in, parrallel to stringer. Deck: ' WEBER ' blue text with black shadow @ s/spot. Orignal - Green sprayed rail panels, sprayed blue shell stencil at rear sweet spot. Restoration - Green over-spray with white stripes. Orignal - Green sprayed rail panels. Catalogue No. 123 : " WEBER (USA) Bonzer, 6 ' 6'', 1974 rider, rare collectable, very good nick." Notes by Mick Mock, PO Box 330 Manly NSW Australia 2095. The board has been extensively repaired and 'restored'. Since the board has been largely recoloured, I assume the paint covers a multitude of repaired dings. It is possible that the weight is the result of fully re-glassing the existing board, including filler and gloss coats. If this was the case, then it is a most unsatisfactory method. Noted 1960's design : The Weber Performer with Hatchet fin. Early 1960's manufacturer, label still operating. 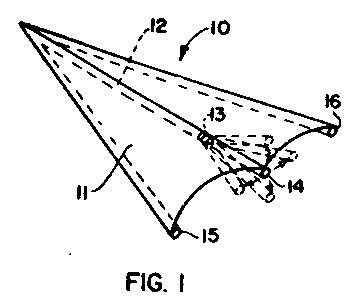 Original design first shaped in December 1970 by Duncan and Malcom Campbell (USA) characterized by forward concave leading to double concave each side of the centre fin with two keel- type fins set on the rails (radically toed-in and cambered). 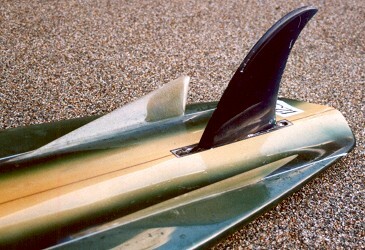 The design then became associated with Bing's head shaper, Mike Eaton, who had played a significant role in the development of the Twin fin 1 in 1970. See image and notes, below. Ian Cairns (Gordon and Smith Surfboards), rode a Bonzer to first place, 1973 Smirnoff Contest, Laniäkea , Hawaii and Terry Richardson (Skipp Surfboards). See image below. Preceeded (contempoary?) 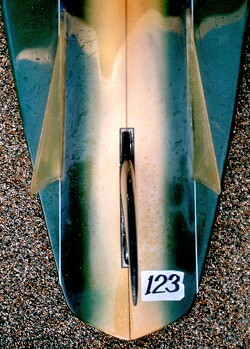 by the Tri-fin of 1971, the design had some influence on Simon Anderson's Thruster of 1981. 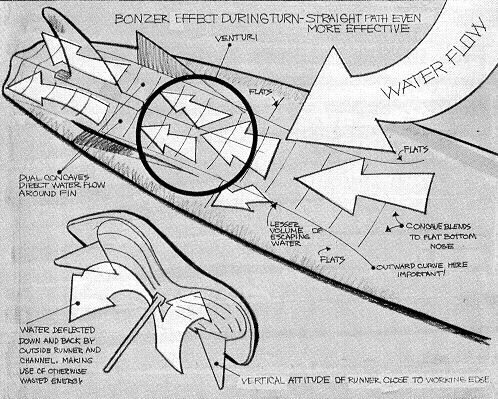 Further adaptation in 1988, the Phazer - a Stinger/Thruster adaptation ( 3 similar fins with 2 small Bonzer D-Fins) initially credited to Rusty Priessendorfer for Rusty Surfboards (USA). 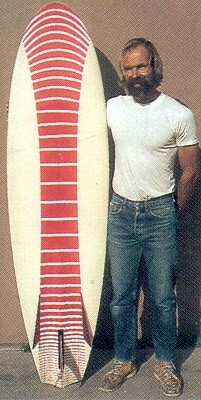 Mike Eaton of California; responsible for reviving the twin fin. Seen here with his 70's brain child 'the bonzer'. Mike Eaton of California; responsiblefor reviving the twin fin. CONDITION: 7 - note weight. Jim Neece : "The Bonzer"
Geoff Cater (2003-2011) : Weber Surfboards Bonzer, 1974.